There’s a reason travellers are constantly flocking to New Zealand to tick us off the mighty backpacking bucket list. New Zealand’s North Island is like one big playground, filled with places to swim, things to eat, mountains to climb, and adventures to be had. Here’s 10 fabulous things to do in the North Island. New Zealand is known for a lot of things, and one thing we’re especially proud of is our breathtaking coastal beaches. 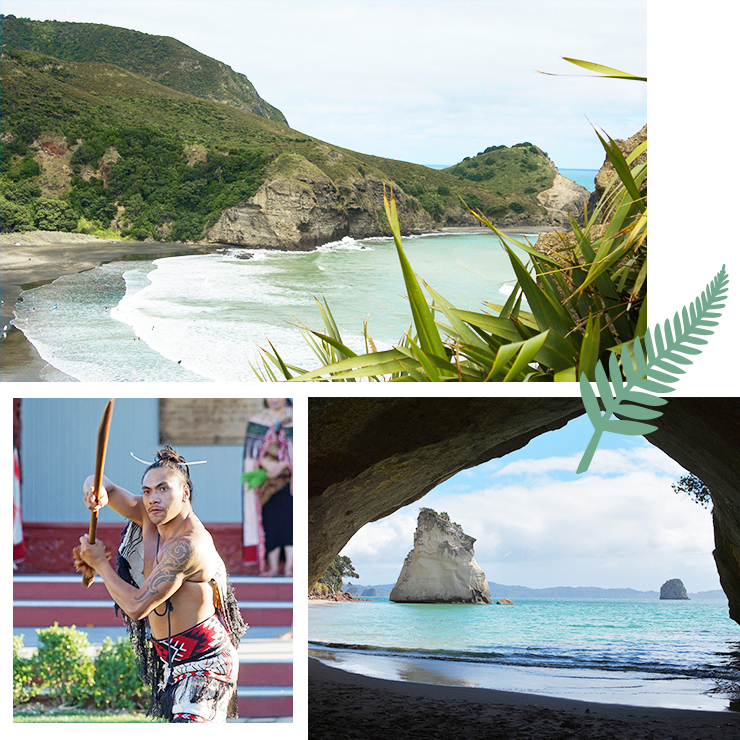 Auckland’s west coast features beaches like Piha, Bethells, and Muriwai which are perfect for hiking, swimming, picnicing and just general lazing around in the sunshine. The high cliffs, black sand, gnarly waves, and great cafès make for an amazing day spent beach hopping down the coast. Brush up on your Aotearoa history and cruise up North to explore the tale-enriched towns of Paihia, Waitangi and Russell. Treat yourself to a stay at The Duke Of Malborough Hotel while you visit the Treaty Grounds and Pompallier House before relaxing back at our favourite, Charlotte’s Kitchen on Paihia wharf. There’s also activities for the thrill seekers, like swimming with dolphins and snorkelling with tropical fish on Piercy Island. Step straight into the Caribbean’s white sands and blue waters by visiting one of the North Island’s most iconic beaches—Cathedral Cove—in the Coromandel. Getting to the beach is an hour-and-a-half round trip walk but it is entirely worth it when you are greeted by the arching cove and vast Pacific Ocean waters. The neighbouring towns of the Coromandel Peninsula are also ideal spots to stop and tuck into some great food. If you’re a total movie buff then we suggest making a beeline straight to Matamata to see the one and only Hobbiton set. Located in Waikato, a short two-hour drive south of Auckland, you can snap a pic outside The Shire door, learn all the best kept secrets about the set, and end the day with a sunset view over the Kaimai Ranges. Every Kiwi has great memories spending a summer at the Mount and there is a good reason for that. Possibly the North Island’s most popular summer hot spot, Mount Maunganui in Tauranga, is only a three-hour drive from Auckland and the place to be when the sun comes out to play. The friendly town has great swimming spots and cafes. If you’re up for breaking a sweat, head to Putaruru and soak in the views of the crystal clear waters of the Blue Springs for yourself. While you unfortunately can’t swim in the springs (it’s currently protected), the Te Waihou walkway and view of the mesmerising water is definitely one to tick off the ol’ North Island bucket list. Another must-do in the North Island is visiting the ol’ Beehive (yep, that’s the name of the parliament building) down in Wellywood. 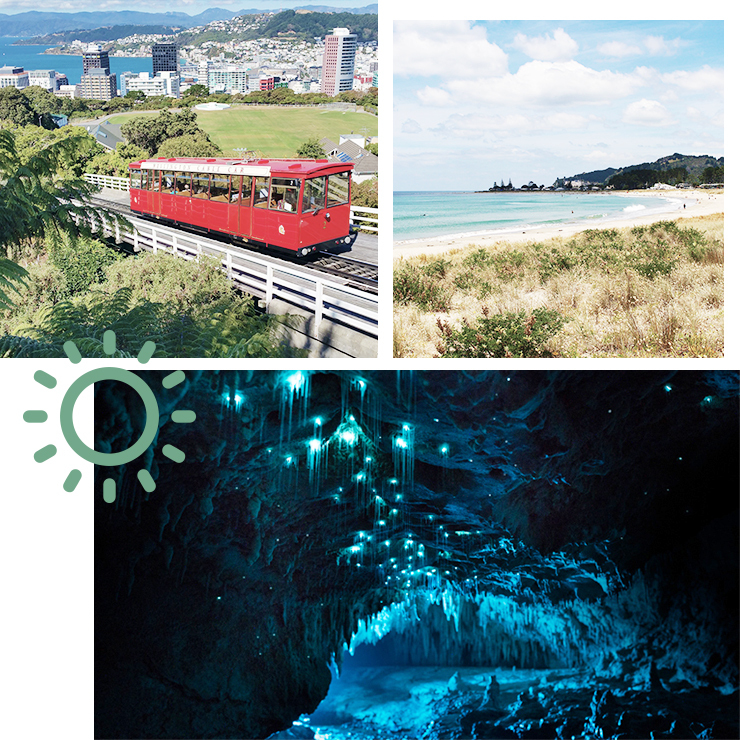 The capital city of New Zealand, Wellington, is situated at the very bottom of the North Island and is home to some iconic places like Parliament, Te Papa museum, the bucket fountains, and Mount Victoria. Spend the morning wandering through the beautiful city and down by the Wellington waterfront before heading to Cuba Street for some shopping and some dining! If you’ve always wanted to achieve your dream of catching gnarly waves in the big blue, Whangamata is the place to be! The Whangamata Surf School takes you out onto the waters of one of the most pristine beaches in the North Island and gets you hanging ten in no time. When you’ve mastered the art of the surfboard, there’s also plenty of great eats and must see and do’s in Whanga’. You can’t make a trip to New Zealand’s North Island without stopping off in Waitomo to catch a glimpse of the real life magic that is the glow worm caves. Travel through the deep underground caves by foot and boat to marvel at the luminescent ceilings and ancient cave wall formations that make the Waitomo region so unique. Take a short ferry ride from the Auckland CBD to escape the hustle and bustle of city life and enter the capital of relaxtion, Waiheke Island. A wine country, holiday escape, and beach haven all in one, Waiheke has a hell of a lot to offer. We suggest stopping by Mudbrick Vineyard and Restaurant or Cable Bay for a wine tasting and a la carte dining before hitting Cactus Bay by kayak for a sunset swim and sunbathe. Once you're done here, check out Auckland's Best Weekend Walks And Hikes.